Interested in Beth Moore? Maybe a little Dave Ramsey? How about Jean Chatzky, one of Oprah’s Debt Diet gurus? Or, maybe you’d like to finally get around to reading American Wife or The Manny? Well then, hop on over to my Amazon book store Lulu’s House of Books and shop away! I’m clearing out some of our library, in order to make room for the Mr’s ever increasing number of grad school books. Our lack of space equals your chance to pick up some wonderful books for a steal! I’m flexible on combined shipping, as well as the price of every item. Care to make me a deal? Thanks again for all your birthday well wishes, as well as the hilarious comments you left about age mishaps you’ve been having as well. So glad to know I’m not alone on that front! As fate would have it, I work up on the morning of my birthday with a *wicked* head cold. What a miserable start to my birthday! I’m blessed to have the opportunity, when an emergency arises, to work from home, so I e-mailed my director (also known as the Coolest Boss I’ve EVER Had) (and no, I’m not just writing that because I know he might be reading this) (And just in case he is, Hi, Boss!) to tell him I’d be working from home that day. I was delirious and head-coldy enough that in my morning stupor, I do believe I made mention to the fact that “yes, I do have a wicked head cold” but “yes, I do also realize that today is my birthday”, and that “I promise I’m not pulling a Ferris Bueller”. “I promise I’m not pulling a Ferris Bueller”…?!? Nice and professional, Lulu. 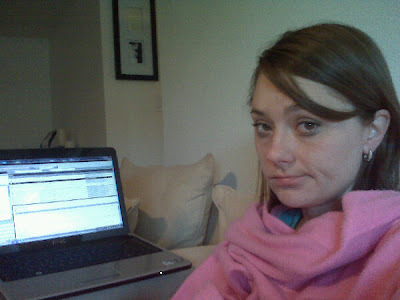 And yes, that is a) a pink Snuggie, and b) the previous day’s mascara smudged under my eyes. I might as well just put it out there now for any future children I may have- I will never wrap presents as well as my mother. Ever. Luckily, Mama Martini *does* wrap a mean birthday gift, and thanks to the magic of Skype, I was able to open them with her from my very couch! The picture of her dog in this photo makes me laugh so hard- the poor pooch kept hearing my voice and was trying SO hard to figure out where I was! I was also able to have one more “Happy Birthday!” Skype date with the Mr. in Argentina, and even received a rousing “Feliz Cumpleanos” from his host family Suzy y Hector. I cannot wait to get to Buenos Aires soon and meet them both, they seem so funny and kind. Happily, my Skype date with the hubs was cut short, as his taxi to the airport had just arrived! Though he wasn’t able to be with my on my birthday, at least I was going to see him less than 24 hours later. See that great mix of purple and orange? Makes you understand the Phoenix Suns’ colors a bit better, no? The Second Annual 28th birthday was capped off by one of my favorite foods- Papa John’s BBQ Chicken and Bacon Pizza. Which I order without chicken OR bacon, rendering it a big pile of cheesy BBQ sauce on bread. Delish. Though I didn’t even leave the house, and the only human contact I had the entire day was with the pizza delivery man, I had a wonderful, content 28th birthday. And the Nyquil nightcap wasn’t half bad either. This may come as a surprise to many of you, but when the Mr. and I moved to Arizona, we decided not to get cable. The F-Word, and all that. So for now, that means no cable box, and no premium channels to speak of. The television goes no higher than 15 now (or to 18, if the Mr. is in the mood to practice his Spanish by listening to a bit of tele en espanol). You know what else no cable means, don’t you? No HGTV. No Bravo. No True Blood. No Entourage. As you can imagine, we’ve come to rely pretty heavily on our second choice for visual entertainment– Netflix. Hours of entertainment can be had just by signing up for Netflix’s $8.99 per month subscription, which allows you 1 mailed disc at a time, as well as unlimited hours streaming on-demand. And the fact that you can now stream all on-demand content from your Wii? Let’s just say we were more than happy to stop staring at our laptops for hours on end. Now, I understand that his media contraption may not be a new concept in your household. However, one thing that we never came across during our 3 years in Manhattan was that elusive red movie rental kiosk I’d heard so much about. The movie made us laugh a lot, and left us with a few new one-liners that will surely pop up in future conversation. I’ll admit that we’re already a tad flummoxed by le redbox though- the other movie we rented, Clash of the Titans, was a Blu-Ray disc, which we didn’t realize, and we’re not Blu-Ray folks yet. So redbox #fail number one for us. 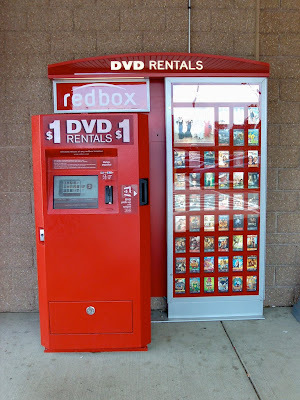 Have you ever used redbox before? What’s your fave way to get entertainment at home? It’s time for the first of many discussions about the new word around the Martini household. Now, before you hit the Unsubscribe button on the ol’ Google Reader, I promise you that I haven’t lost my polite senses. While my husband navigates the exciting seas of graduate school, we’ll be gettin’ our frugal on in every way we possibly can. I know it won’t be easy, but I’m hoping that you out there in BlogLand will be able to help me find a way to happily pinch pennies for the next 2 years. My goal is to find that (elusive) middle ground where we can save as much money as possible, while trying to keep ourselves from feeling deprived beyond measure. Because we all know that’s a one-way ticket to a wicked retail therapy session. And that’s just counter-productive, now isn’t it?! I hope to share with you any tips and tricks I come across, and I would *love* for you to drop buy and share any tidbits you have for me. Stay tuned for more F-Word coverage as it pops up! I’ve been home sick for the past 2 days with what I think is the stomach flu (seriously, who gets the flu when it’s 112 degrees outside besides me?!??). I wanted to introduce you to a little gentleman that’s been providing me lots of giggles while I’ve been under the weather- Marcel the Shell with Shoes On. He’s brightened my day on more than one occasion… I hope he brightens your Friday too! No, this isn’t a post about that birthday tradition where people are so terrified of turning 30 that they stop counting at 29 and hold an annual celebration instead. Today is my 2nd annual 28th birthday, because this I have spent the entire past year genuinely believing I was 28. Which I was not. I can’t really tell you where the whole “I’ve incorrectly stated my age for the entire last year” pheneomenon started. Looking back, I do vaguely remember being excited by the presence of a 7 in my age (my favorite number to write- add THAT to your official Fun Facts About Lulu list). Is it because there wasn’t a lot of pomp and circumstance surrounding my actual birthday day last year? I had decided to discontinue the habit of taking a vacation day from work off each birthday (well, I didn’t actually HAVE any vacation days to take off, since I had used up EVERY vacation day for the entire year by May 1st for our wedding and honeymoon. Leaving me with ONE bloody vacation days for 8 months of work. But I digress.) so maybe the lack of birthday attention contributed to the mishap. Or maybe it was the fact that the Mr.’s a wee bit older than I am, and I’ve been focusing so much on his turning 30 next March, that I just sort of felt like I was close to 30 as well. It could have also been that phenomenon that seems to occur where all 20-something ages, after you turn 25, seem to become fuzzy and sort of run together. Kind of like your memories of partying in college. (Not that I did any of that.) I know I’m not the only one who’s made this general observation on the “late twenties haze”, so I know it could have been a factor. 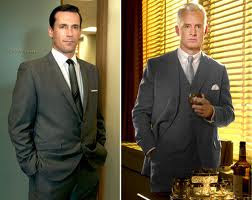 – While getting to know my new boss better, he asked my age (very courteously, I might add, which men have seemed to have forgotten these days.) “Why, I don’t mind you asking at all- I’m 28 years old” was my reply. – While signing up for a membership at the local YMCA, I noticed that the staff quoted a different membership price than the one the Mr. had researched for me. “Well ma’am, the $30 fee is for those 27 years old and younger,” the kid replied. “Oh, that SILLY husband of mine!” was my response. “He doesn’t even know how old I am, and we’ve been together for 5 years!” So I signed up for the 28+ membership, which was $15 more per month. -The final straw? While booking Miss E’s flight reservation for our recent trip to BlogHer, I had an epiphany. Which led to me freaking the heck out, because I felt AWFUL for not making a bigger deal out of E’s birthday 2 weeks prior. Because it was her 30th birthday and OMG what kind of friend am I for missing her 30th birthday! So I do what any self-respecting friend would do- text another person for ratting myself out on being such a bad friend. To which our dear friend Lonnie told me that I must be smoking crack, because E just turned 29. Because she’s a smidge over a year older than us. Because we’re 27. So happy 28th year of life to me. Again. I have a confession for you all. Yes, you read that right. I’m a married woman, and I have been internet dating for the last 5 weeks. G-chatting, Skyping, video flirting, and shamelessly texting at all hours of the day and night. I think it’s high time I finally came out about it, and introduced you to my online boyfriend. Who is that, you’re probably asking? Who is this newlywed trollop gallivanting across the interwebs with?!? Well, Dear Reader, that is my husband. My husband lives in Argentina. I’ve been reluctant to write about the Mr.’s adventures abroad, since saying “Hey Internet! I’m a tiny little girl with minimal tae kwon do skills living all by myself in a shady apartment complex for the next 5 weeks!” isn’t exactly the safest thing to do in my new neighborhood. I haven’t gone it alone, since I have have a great job to keep me busy and many wonderful friends to keep me entertained while he’s been away, but it’s definitely been rough at times to cope with the absence. It’s been quite the experience, spending the majority of the summer living in on a different continent than my spouse and adjusting to life as a wife living by herself. If you’re a new reader, you might not know that this isn’t the first foreign country that my travel-focused Mr. has lived in (or even the second, third, or forth). However, it is certainly the first time that we’ve officially been man and wife, while living in completely different hemispheres. It’s been tough, it’s been adventurous, and I’m happy to say that it’s almost over. My husband is coming home! I can’t wait to hear more about his big adventure, and relay some of his awesome experiences to you all. And I especially can’t wait for the inevitable justification for buying a polo pony. On one salary and graduate school loans.